Welcome back to Term 2. I hope you have had a very restful and relaxing holiday and enjoyed some of this stunning Autumn weather! After an 11 week term, I'm sure the children will be ready to get back into it! This term we have a focus on Mini beasts in Science, Aboriginal Culture and places of significance in our local environment in our HASS and Art units. We will also be looking at ANZAC day and how the importance of this day is recognised in our history. 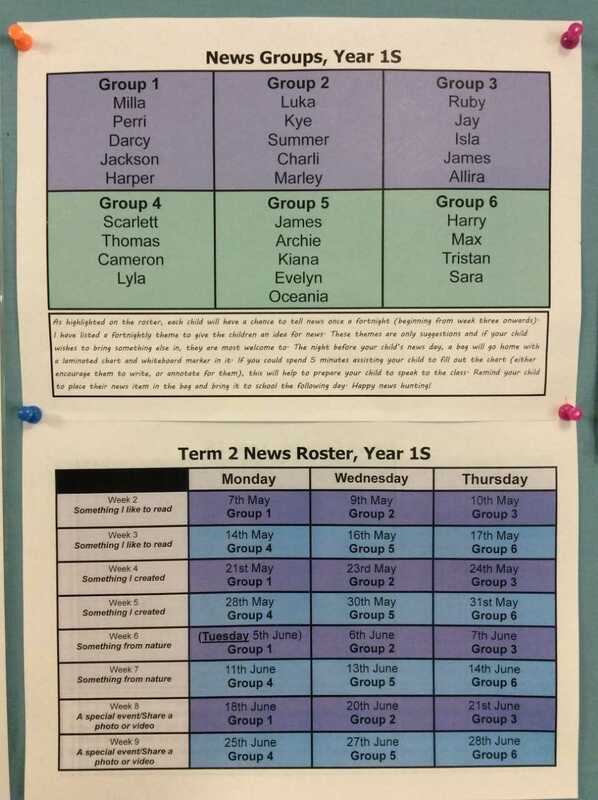 We sent home a news roster last term but please see the picture below if it has gone missing! The children are very excited to be starting their Think Mentals Math book this week which was purchased at the beginning of the year. Mental maths such as addition and subtraction, counting on, sequencing of numbers and number recognition are some of the concepts that we have covered in class. These will be reinforced in our Think Mentals book that will help your child gain confidence and apply mathematical concepts in a fun and supportive way. In supporting our Math program in class, we would like for your child to complete one unit over a fortnightly period (5 columns of Maths question). When completing questions with your child, we would ask that you support them by reading questions if necessary and marking the questions to give your child instant feedback on how they went and writing their score at the bottom of the page. We encourage you to use a combination of visual and manipulative tools such as number lines, hundreds charts or counters to help your child complete these tasks. Please do not spend more than 10 minutes at a time completing these activities and make it a part of your child's reading and sight word routine. At the end of the fortnight, the books will be collected by myself and checked to make sure your child understands the concepts covered. We ask that your child does not complete more than one unit a fortnight as to ensure we can review these concepts in class if necessary.Unit One will be due at the end of week 2 (Friday 11th May) as we have completed Day One of Unit One in class. This is the wonderful friendship and social emotional program that we will be starting this term to support the children in helping them make better friends and strengthen and foster healthy relationships. Within the program the children may be starting to use the language of UR Strong: Friendology including: 'Friendship fire', 'Talk it out', 'Quick comebacks' and the 'Friend-o-cycle'. We will be providing some information to parents on the blog as we complete the lessons of the program. 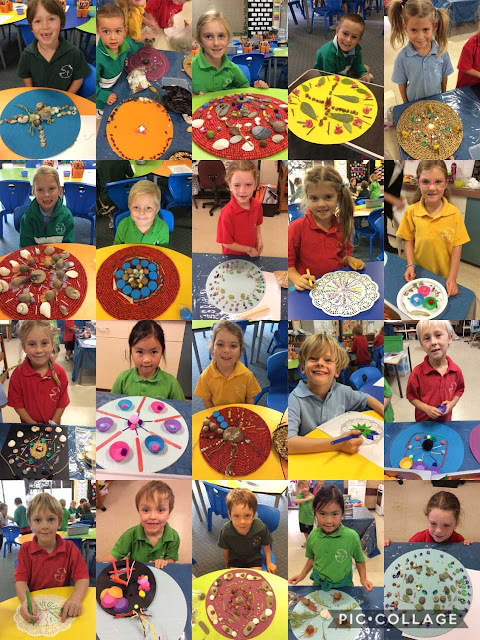 On the final day of Term 1, we worked on an inquiry task where we explored and created our own mandala designs. Did you know that the symbol of the mandala represents the universe? We created mandalas using doilies, colouring materials and loose objects that we placed on mats and trays. Many thanks to all of you for organising the children with engaging materials for them to manipulate - we had some interesting items including shells, fresh flowers, bottle tops, twigs, leaves, coloured stones, beads and gumnuts. The children had lots of fun playing with their designs and there was a great sense of calm in the classroom while they shared materials and thought carefully about their arrangements. The Year 1S parent roster is outside our classroom on the parent information board. Please feel free to write your name down to help during one of our morning sessions throughout the term. We were lucky enough to have fantastic parent support last term, your assistance in the classroom is greatly appreciated. Thank you for your ongoing support. One last reminder that my email is still listed under my maiden name amy,rundle@cewa.edu.au - I will let you know when this changes!